DALI is an acronym that stands for Danish Audiophile Loudspeaker Industries. 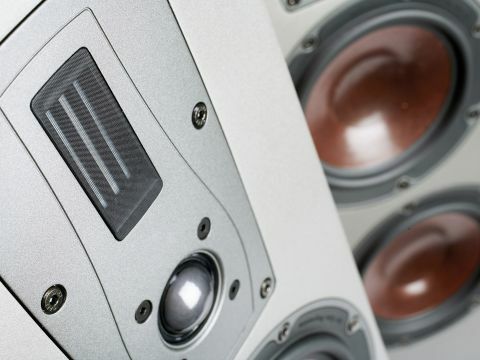 The company makes a number of different speaker ranges to appeal to a wide variety of customer priorities. Those placing stereo music performance at the top of their agendas have hitherto had to choose between the excellent, affordable Ikons and the considerably more costly ranges. This is more than a mere gap-filler. At £2,200 per pair, the Mentor 6 falls roughly halfway in price. It has 'two-and-two-halves-way' configuration, uses DALI's dome/ribbon treble module theme, plus twin bass/mid drivers arranged so that the lower unit is only used to add extra bass oomph. In fact, the Mentor 6 has superior quality drive units, and substantially built, real wood, cherry-veneered enclosure. The two 165mm cast frame bass/mid drivers have DALI's proprietary dish-shaped 125mm paper/wood fibre diaphragm. Each operates into its own sub-enclosure, and each of these is reflex-loaded by its own rear port, tuned to 37Hz. The treble module combines a 28mm soft dome and a 17x45mm ribbon on a single chassis. The ribbon operates above 10kHz, partly to extend the bandwidth, and partly to ensure consistent and wide lateral distribution. The rear panel accommodates two pairs of good quality speaker terminals. The speaker comes pre-fitted with a black MDF plinth, and the very deep enclosure further enhances stability, though the spikes have only thumbwheel lock-nuts. The Mentor 6 delivers a whole lot of low bass, which is often welcome, but sometimes too intrusive, as the end result can 'thump' a bit with some material. This low bass emphasis is rendered that much more obvious because output through the upper bass and lower midband is a rather lean and dry. This leaves bass instruments - both electric and acoustic - lacking in both warmth and punch. For example, the drive imparted by a bass guitar at full pelt, and the dynamic tension generated by cellos, are both muted and somewhat understated. The midband proper sounds both uneven and slightly forward. This tends to highlight detail, but this is welcome. And, although boxiness is well controlled, there are some traces of upper-mid nasality, which again tends to be emphasised. On the plus side, the treble is strong but also impressively sweet, clean and smooth, bringing worthwhile delicacy and transparency to the party. The strong deep bass proved too much under our room conditions, so the Mentor 6 loudspeaker would be better suited to a larger space or a more bass absorbing structure.